High on the hill, perfectly located to bask in the views overlooking Queenstown, is your perfect holiday home. 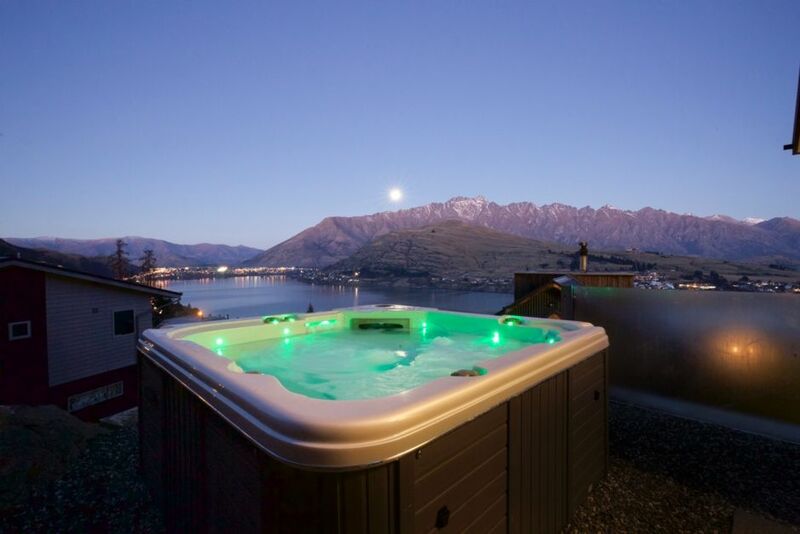 Perfectly located in a quiet, peaceful cul-de-sac just minutes from Queenstown’s activities, bars and restaurants – you’ll return after sightseeing to relax and watch the sun set over the mountains as you reflect back on your exciting day and plan your next adventure. ‘Heaven on Hensman’ offers our guests four outdoor entertainment areas, two separate lounges, three ensuite bedrooms, a spacious ‘chef’s’ kitchen and separate dining area. Located centrally between the airport and CBD, and offering free unlimited high-speed WiFi, you’ll have everything you need for your perfect Queenstown holiday! This is a rare and unique opportunity for you to have a genuine experience and live like a local. A modern, luxury, three bedroom home with views to die for! Architecturally designed as a holiday home, the layout of the rooms and entertainment spaces are deliberate to ensure plenty of natural light and our famous Queenstown views are enjoyed from every room. The main house offers three ensuite bedrooms. For larger groups of 8 or more, access includes the self contained unit on the ground level. Bedding configuration requests must and should be communicated at the time of booking to avoid confusion or disappointment. The main house offers 3 ensuite bedrooms. For groups of 6-8 people, there are two roll-away beds andamp; a set of bunk beds. Bedding configuration requests must and should be communicated at the time of booking to ensure the house is correctly prepared for your arrival. The self-contained unit on the ground level is rented out separately. Guests staying at 'Heaven on Hensman' must respect the privacy of the guests staying in the unit. The Unit is included for 8 or more guests. Great location. Beautiful views. Nice big house for our two families. Love the spa! Only issue was the heating in the studio too hot and couldn't be adjusted. The property was beautifully looked after and had spectacular views. It had everything we needed and was a great base when travelling with toddlers. Super close to town and airport fantastic location. Fantastic views, great large bathrooms and two main bedrooms, warm... and well supplied with shampoo Conditioner and liquid soap in all bathrooms and Laundry powder. However couches are extremely uncomfortable they are hard as a board.. Look great in pics but terrible to relax on. Location and panoramic views outstanding.